Catch all the live scores and updates from Gold Coast. 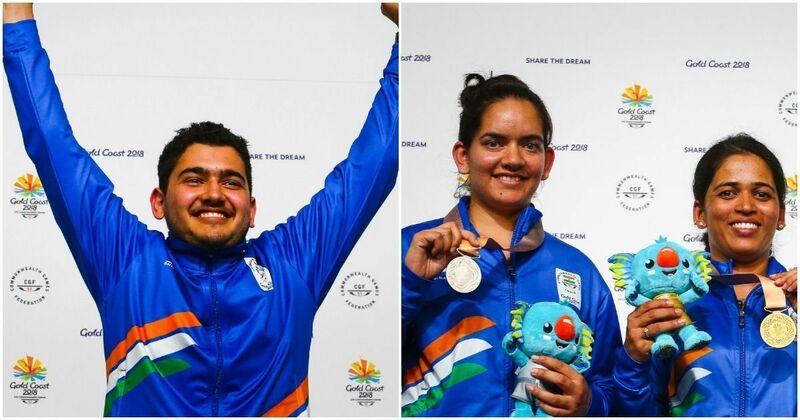 Anish Bhanwala, 15, becomes India’s youngest ever gold medallist at the Commonwealth Games after winning the Men’s 25m Rapid Fire Pistol final. Second medal of the Games for Tejaswini Sawant, who wins gold in the 50m Rifle 3 Positions to add to her silver in the 50m Rifle Prone. Anjum Moudgil also wins silver in the 50m Rifle 3 Positions. Indian wrestlers continue to dominate at Gold Coast, with Bajrang Punia winning gold, Pooja Dhanda and Mausam Khatri a silver each, and Divya Kakran a bronze. Well, what a frantic Friday this has been! We have all have been just trying to collect our breath - and tomorrow promises to be much more exciting. Join us, then. Till then, have a good night. 07:00 pm: Tejaswini Sawant bagged the World Championship gold in the 50m prone in 2010. Then, she went missing from the shooting scene. 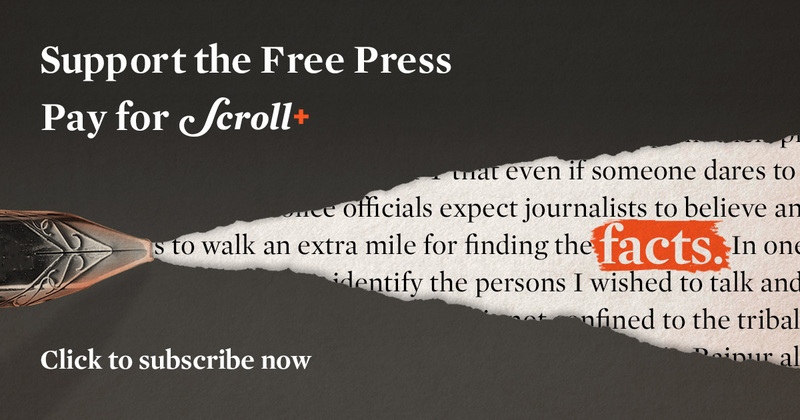 What really happened between 2010 and 2018? Read Abhijeet Kulkarni’s piece on the inspirational talent. 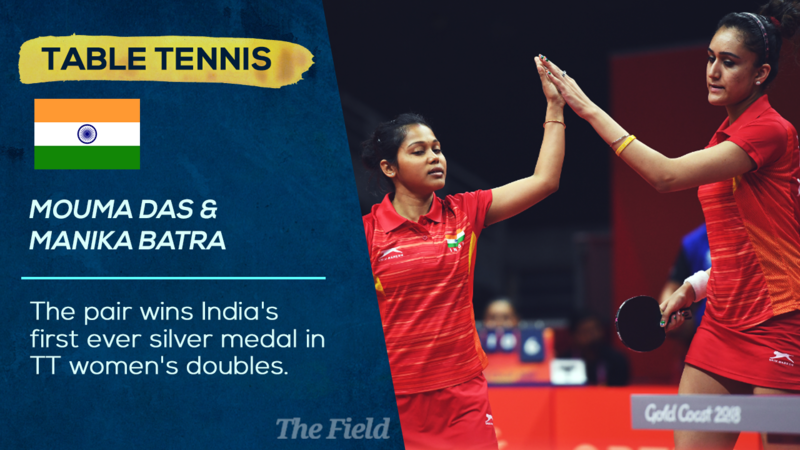 6:15 pm: What a Commonwealth Games this is turning into for Manika Batra and Mouma Das! 5:57 pm: How about this in badminton? India have a STRONG presence in the semi-finals! 5.42 pm: A quick round-up of the day’s boxing action. Good stuff all around! 5.30 pm: Satish Kumar is through to the final, beating Keddy Agnes. His opponent’s corner threw in the towel. There were a couple of cuts above the eye and they decided not to risk it. He becomes the sixth Indian boxer to make it to a final. 5.24 pm: Men’s +91kg Semifinal. Satish Kumar is going for a place in the final. 5.04 pm: Woohoo! 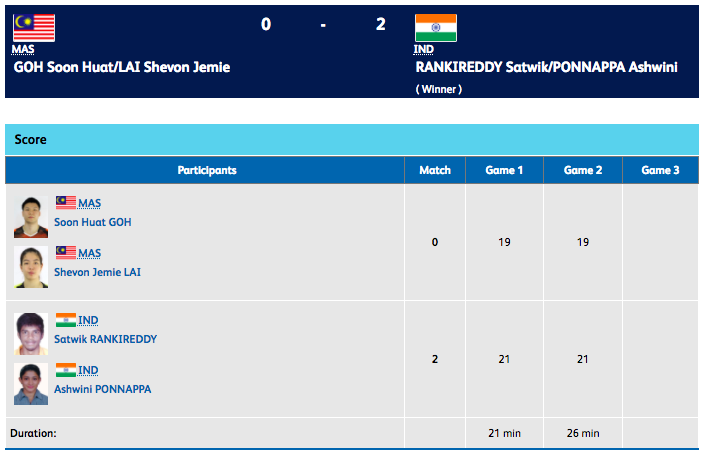 Big win for Satwik Rankireddy/Ashwini Ponappa. They have beaten the World No. 7 Malaysian pair Goh/Lai 21-19, 21-19 to storm into Mixed Doubles Semis. They will next face England’s Ellis Marcus/Smith Lauren in the semis. 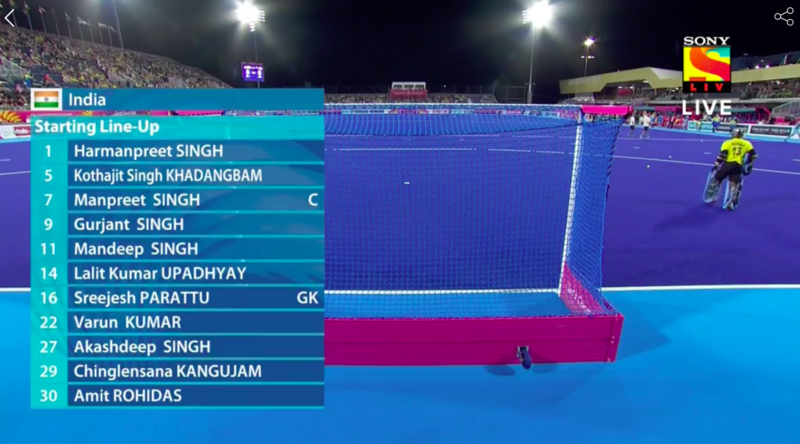 4.55 pm: HS Prannoy is through to the semi-finals. Easy win for him but he runs into Lee Chong Wei in the semis. In the other semi-finals, Kidambi Srikanth will clash with Rajiv Ouseph. Should be fun! Lots and lots of missed opportunities for India in the second half. Just look at those numbers: 18 shots on goal, just 2 goals. NZ, by stark comparison, has 7 shots and 3 goals. New Zealand have beaten India in the semi-final. 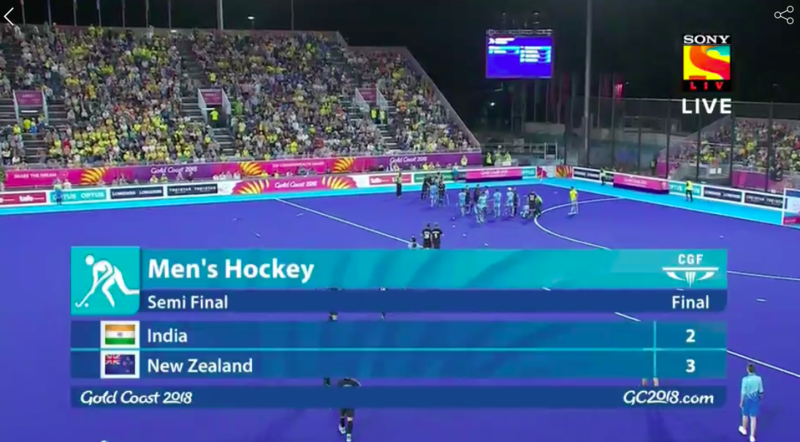 It was a close game but New Zealand played smart hockey. They had a plan and they stuck to it. India had an up and down game. The poor start came back to haunt them. 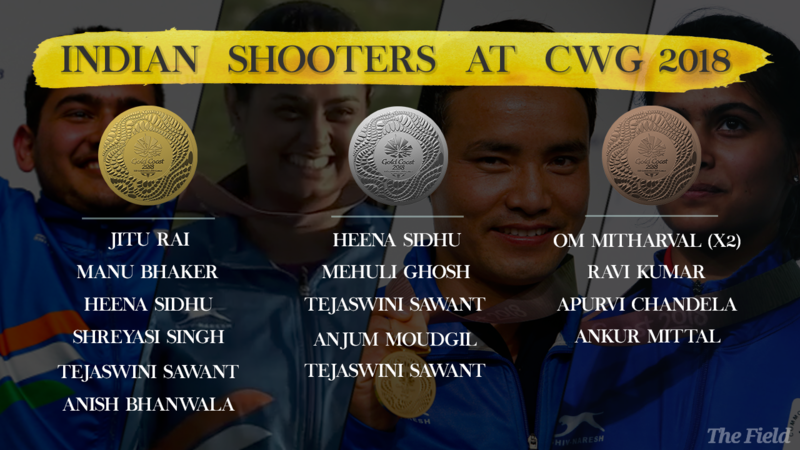 India have never won a CWG gold medal. And there we have it. We are running out of time but India have a goal! This will go right down to the wire. 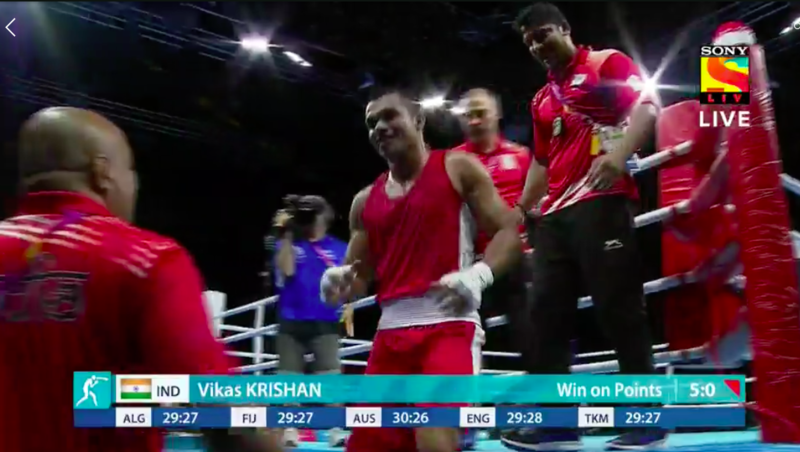 4.29 pm: Vikas Krishan wins and is through to the Men’s 75kg final. Dominating performance by the boxer. He knocked down his opponent once as well. Manika Batra and Mouma Das were not really at their best in the final but thoroughly deserved the silver medal for the fantastic run they had till this point. This is the first ever silver in this event for India. Only medal before this (in this event) for India was bronze in 2010. 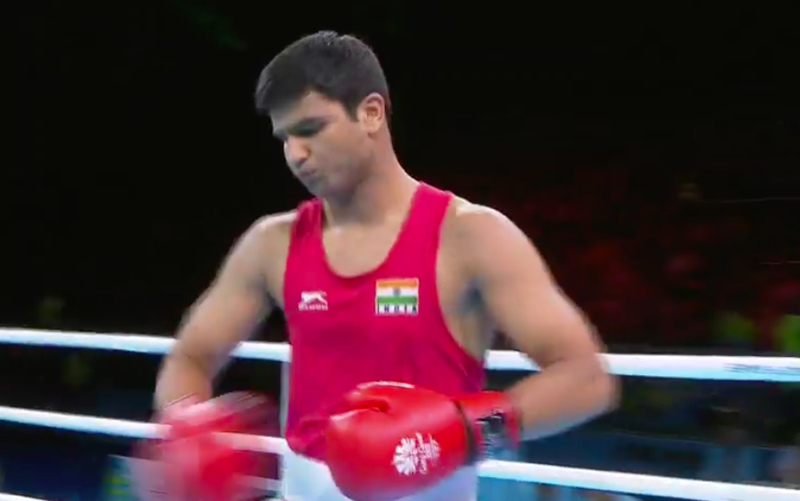 4.14 pm: India’s third bronze medal from boxing - Manoj Kumar joins Hussamuddin and Naman Tanwar. 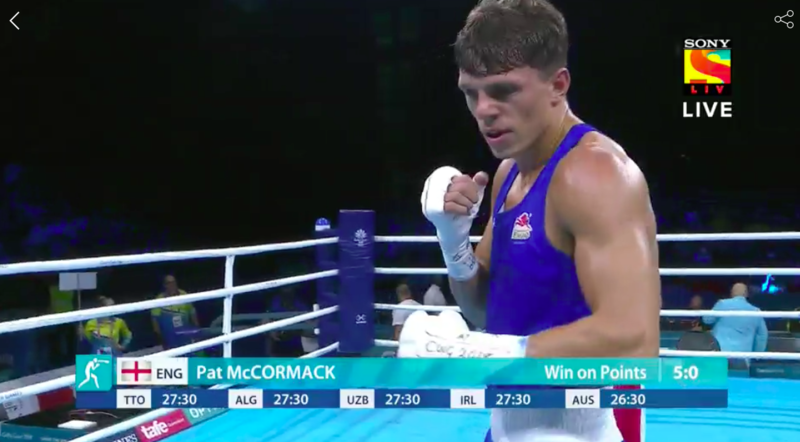 Manoj brawled his way through the fight but Pat McCormack was too good on the day. Third quarter ends. NZ still lead and India will need to find the finishing touch against a stubborn opponent. And the Kiwis get another goal. Originated from the PC and good solid finish by Child, he was alert to the opportunity. 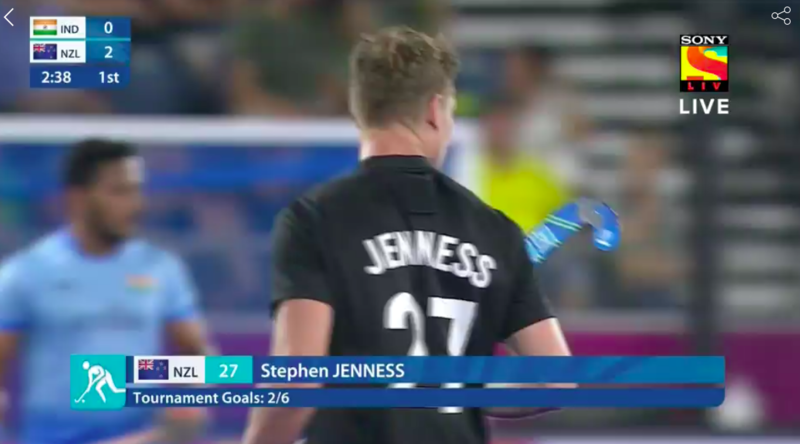 His first goal of the tournament. Good starto the third quarter for India, the pace is certainly up and that is how India likes to play. This will get interesting now. 3.44 pm: BRONZE NO. 2 for India! Hussamuddin loses in the SF by an unanimous decision but it’s a medal on CWG debut for the youngster. Well played! 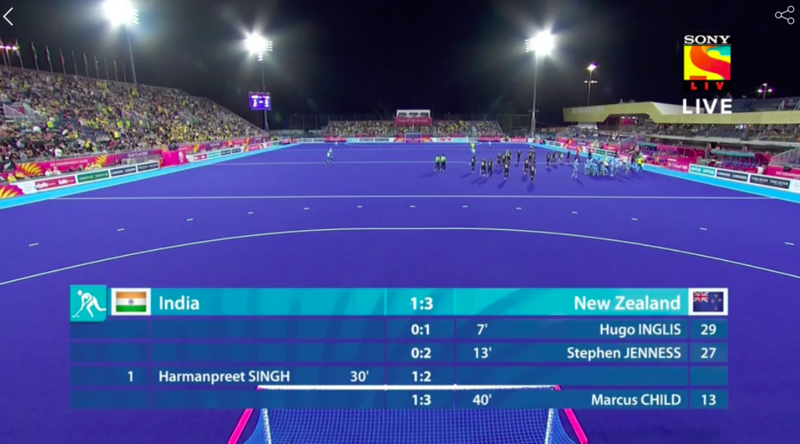 As the second quarter came to an end, Harmanpreet got one back for India through a penalty stroke. A penalty corner led to the penalty stroke but India needed this. This will give the match a new dimension. 3.35 pm: In the women’s doubles bronze match, India’s Sutirtha Mukherjee & Pooja Sahasrabudhe lost to Karen Lyne/Ying Ho (MAS). Second quarter. New Zealand are being patient about this. India, on the other hand, are certainly being more active. The Indian defence needs to wake up though, still too dormant. Second quarter. 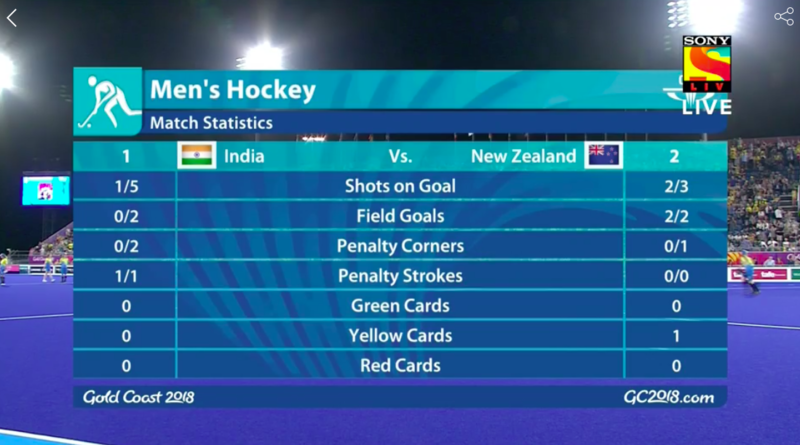 India’s forwards are starting to press the NZ defence a bit more now. But NZ have a lead and they will be hard to break down now. For starters, India need one goal. 3.25 pm: Some good news from badminton. P.V. Sindhu beats Brittney Tam of Canada 21-14, 21-17 to enter the women’s singles semifinal. She will face Michelle Li or Soniia Cheah in the final four. One win away from improving her Glasgow result. End of 1st quarter. 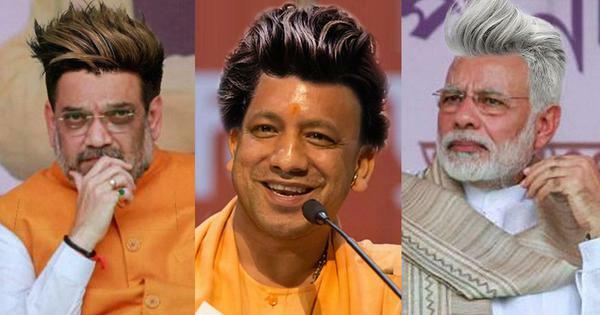 India need to get their heads in the game here. GOAL! Poor play in the defence again. 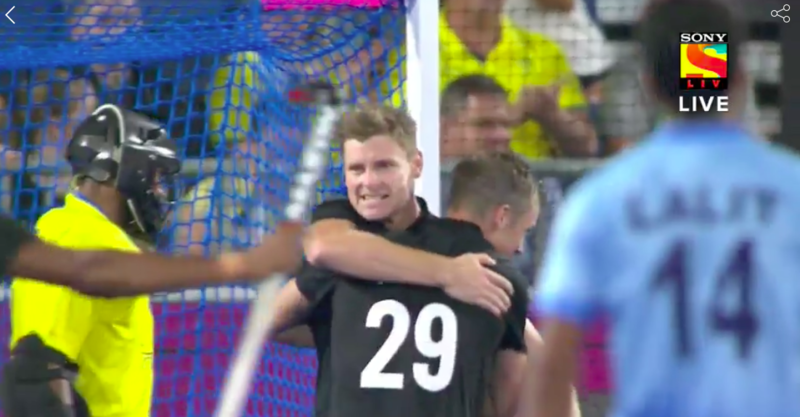 Bad pass, Manpreet couldn’t control and NZ now are two goals up. India are digging themselves into a big hole here. GOAL! Hat-trick of errors and superb finish gives NZ the lead. Lovely reverse hit by Inglis from the left. Sreejesh was a bit off the goal-line and that opened up the angle. Five minutes into the first quarter, still no goals. But India are looking positive and they have a sprint in their stride today. 2.58 pm: The men’s hockey semi-final is scheduled to begin at 3.00 pm. 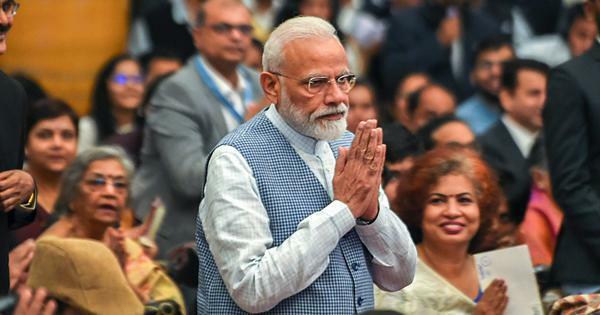 2.47 pm: It’s been a day of firsts for India! & @SauravGhosal become first Indian pair to reach mixed doubles final. 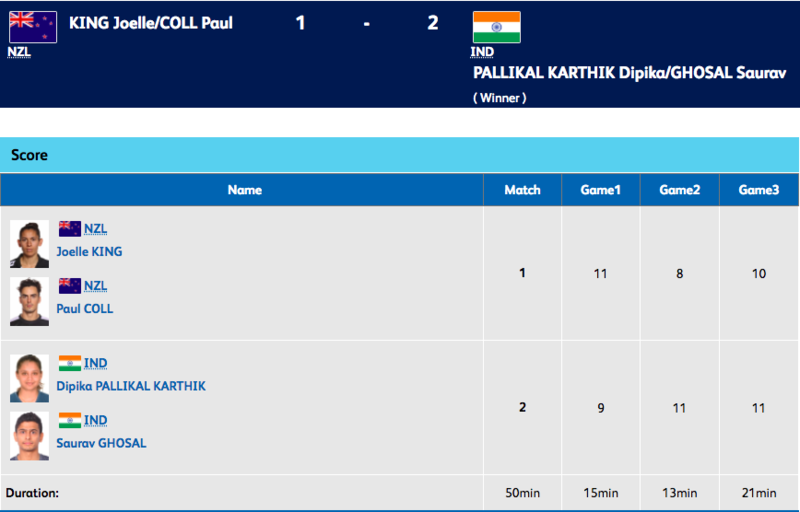 Unfortunately for India, there won’t be an all-Indian men’s doubles table tennis final at Gold Coast as Sanil Shetty and Harmeet Desai lose their semi-final to England’s Paul Drinkhall and Liam Pitchford in straight games. The English pair will take on Sharath Kamal and Sathiyan G in Saturday’s final. 2.35 pm: India’s next-gen is going strong at the Commonwealth Games! Dipika Pallikal and Saurav Ghosal are through to the final after winning a tense semi-final in three games against New Zealand’s Coll and King. The deciding game was won by the Indians 11-10! South Africa’s Martin Erasmus proves to be too strong for India’s Mausam Khatri in the gold-medal match as the African champion wins his fourth straight match by technical superiority! 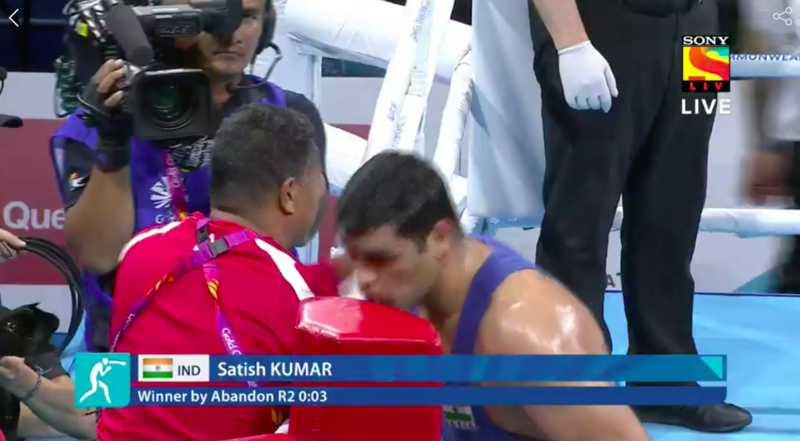 Erasmus won two four-point take-downs in the first period itself and from there, there was no coming back for Khatri, who gets the SILVER. 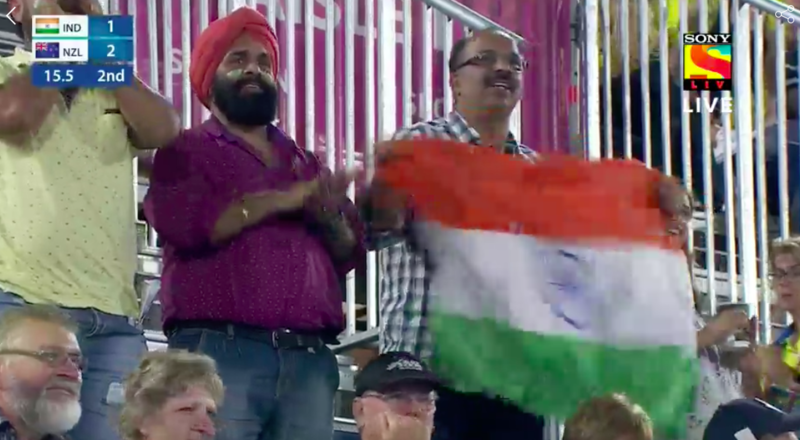 Another semi-final featuring India is underway, where Dipika Pallikal and Saurav Ghosal are battling hard with one of the favourites – Joelle King and Paul Coll from New Zealand, who had defeated Joshna Chinappa and Harinder Pal Sandhu earlier. Can Dipika and Saurav make up for their compatriots’ defeat? Over in table tennis, Sharath Kamal and Sathiyan G are through to the final of the men’s doubles event after beating Singapore’s Yew En Koen Pang and Shao Feng Ethan Poh 3-1. This was a dominant performance by the Indians after slipping in the first game 7-11. The Singaporeans didn’t know what hit them after that though, as they were able to score only nine points combined in the next three games. Sharath and Sathiyan will play for gold on Saturday and they’ll hope their compatriots Harmeet Desai and Sanil Shetty win their semi-final to join them in the summit clash! 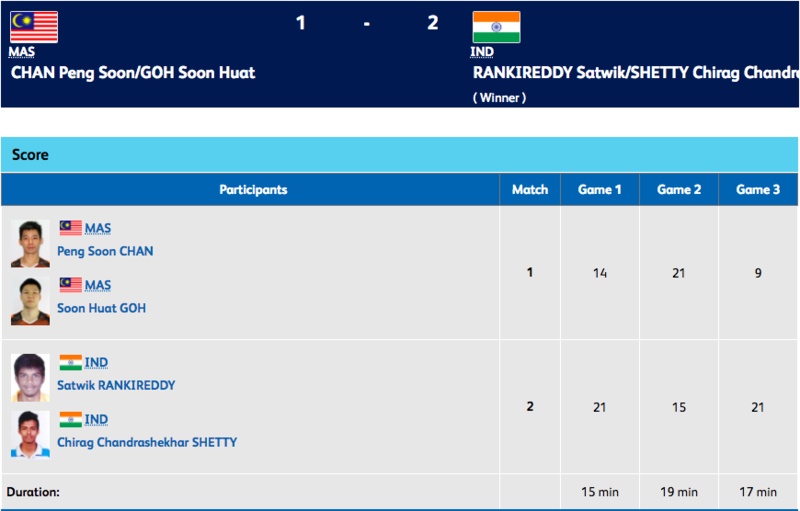 There’s been a rare defeat for India on the badminton courts – Sikki Reddy and Pranaav Jerry Chopra have just gone down in straight games to Malaysia’s Peng Soon Chan and Liu Ying Goh in the mixed doubles quarter-finals. 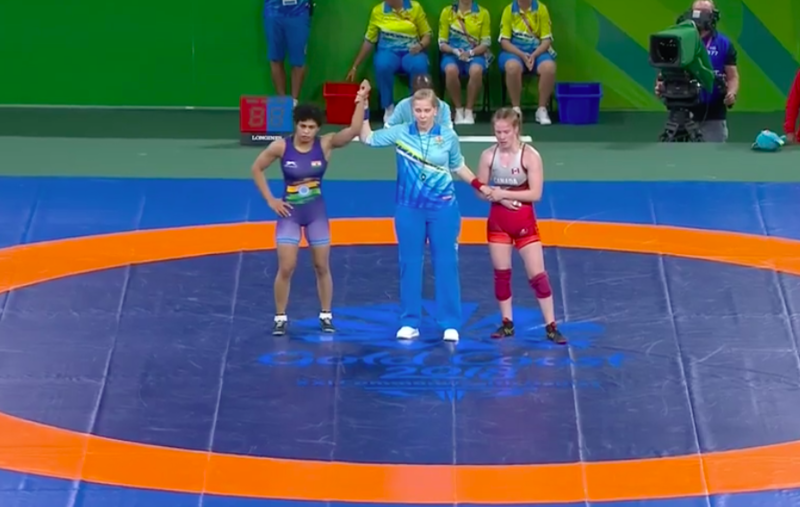 Meanwhile, Divya Kakran pins down Bangladesh’s Sherin Sultana less than a minute after their bronze-medal match starts and is awarded a victory by fall! Blink and you miss! Divya Kakran wins the BRONZE! 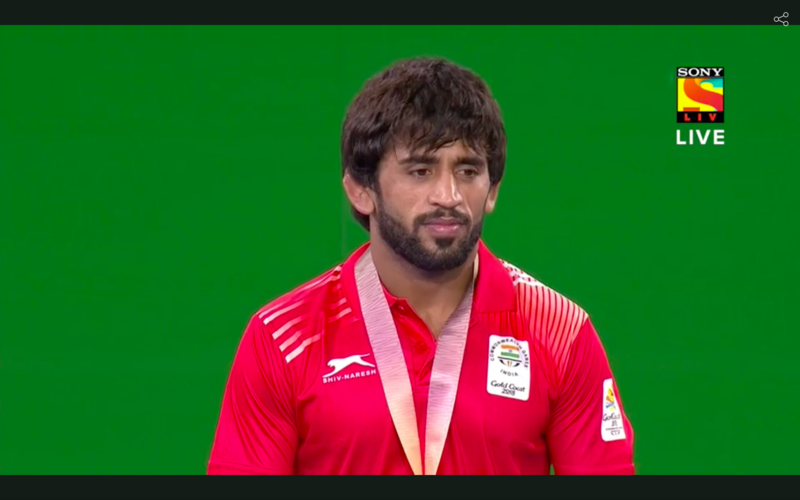 1.52 pm: Bajrang Punia has just received his gold medal – a thoroughly deserved one after winning all four of his matches by technical superiority! He was in a hurry to get done, it would appear! What a thriller! 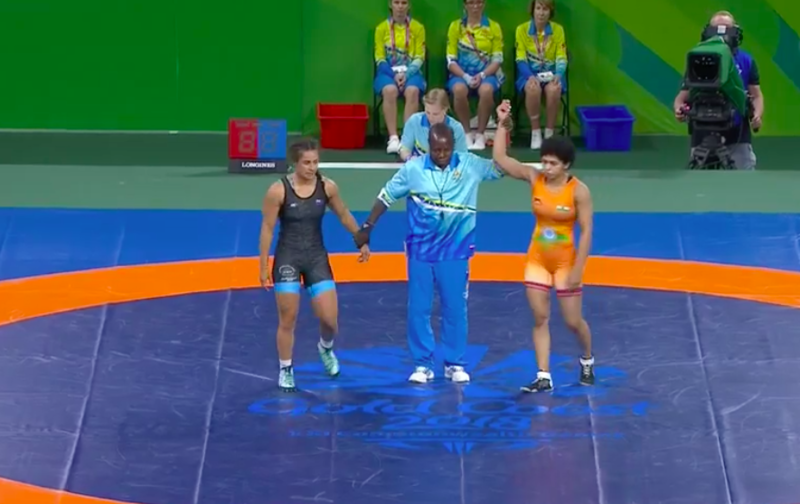 India’s Pooja Dhanda and Nigeria’s Odunayo Adekuoroye, who is the defending champion, engage in one of the best wrestling matches of the tournament so far! Adekuoroye was on top for most of the match and had a 6-1 lead after the first period. However, Dhanda fought back in the second period to win two two-point take-downs to narrow the gap to 6-5 with seconds to go. But it was the Nigerian who won the final point and took the match 7-5, and thereby, gold. Dhanda wins the SILVER. And it’s GOLD for Bajrang Punia! He didn’t even take one full period to secure it! Bajrang raced to a 10-0 lead in just over a minute to win by technical superiority and add to the Indian wrestlers’ gold tally, which currently stands at three! 1.17 pm: The gold-medal match of the Wrestling Men’s Freestyle 65 kg has started with India’s Bajrang Punia taking on Wales’s Kane Charig! 1.10 pm: In about 20 minutes from now, a big session of table tennis action will begin: Men’s doubles semi-finals followed by the women’s doubles bronze-medal match and final. Indians are involved in all four matches! Divya Kakran will not contest for gold after being beaten by Nigeria’s Blessing Oborududu emphatically in their semi-final. 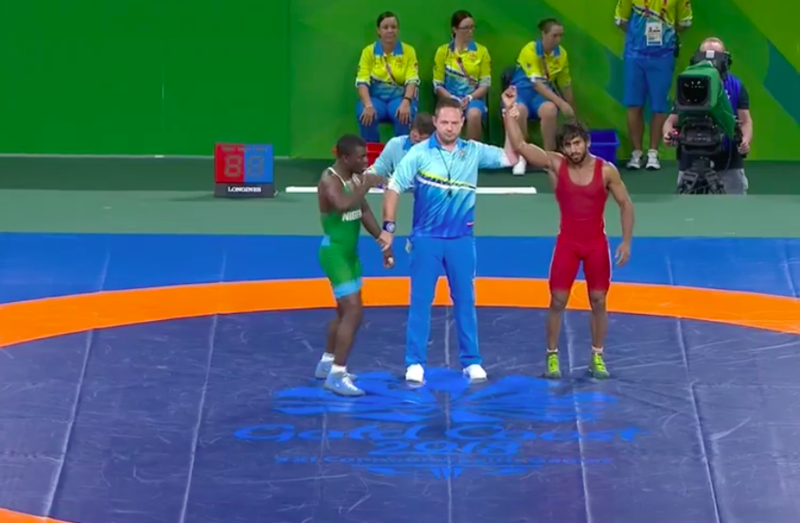 The Nigerian won by technical superiority after taking a 11-0 lead late in the second period. Divya will get a chance to fight for bronze later today. 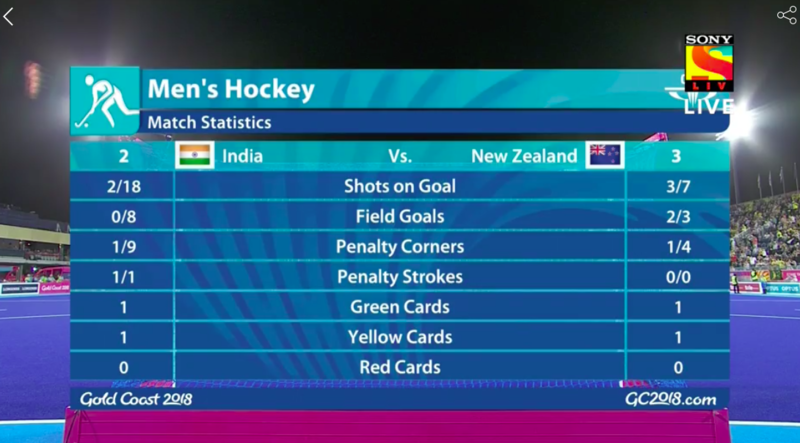 This has got to be one of the biggest upsets for India at the Games so far. Second seed Sathiyan G saved a few match points in the 4th game, but couldn’t find a way past. Walker put Sathiyan under immense pressure with his variations and it paid off. Tough loss for India’s top-ranked TT player. India’s Sathiyan G has been knocked out by England’s Samuel Walker in straight games, which means Sharath Kamal is the only Indian to make it to the men’s singles semis. Pooja Dhanda qualifies for the gold-medal round of her category after beating Cameroon’s Joseph Essombe Tiako 11-5 on points. The match was a lot more competitive than the scoreline suggests and the Cameroonian gave Dhanda a good fight. 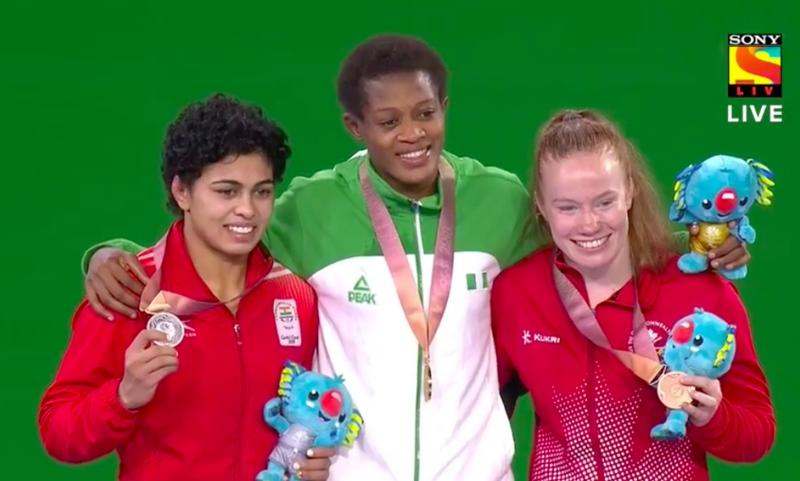 However, Dhanda was the better wrestler out of the two and she deservedly makes the final, where she will take on Nigeria’s Odunayo Adekuoroye in the battle for gold. 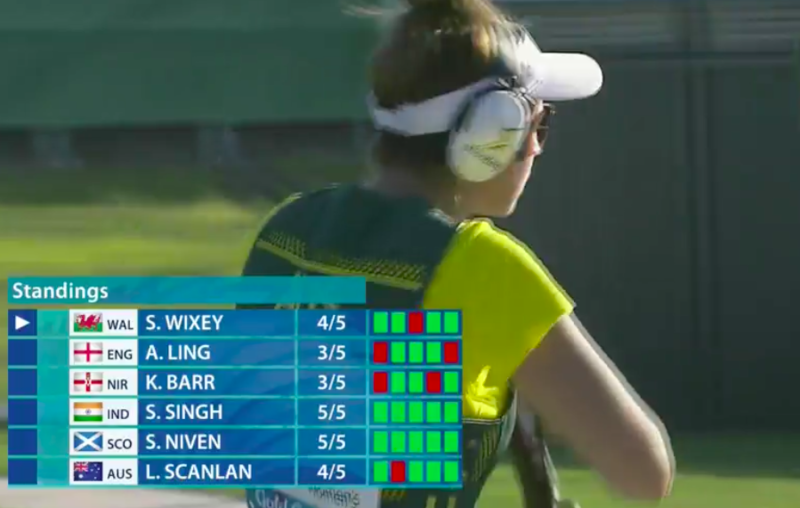 12.18 pm: Australia’s Laetisha Scanlan wins the gold in the women’s Trap after setting a new Games record! She missed only 12 out of the 50 shots she took! Shreyasi Singh is eliminated after 30 shots, as her score of 21 was the joint lowest in the field. England’s Abbey Ling, who also scored 21/30, survived because she had a higher qualifying score. 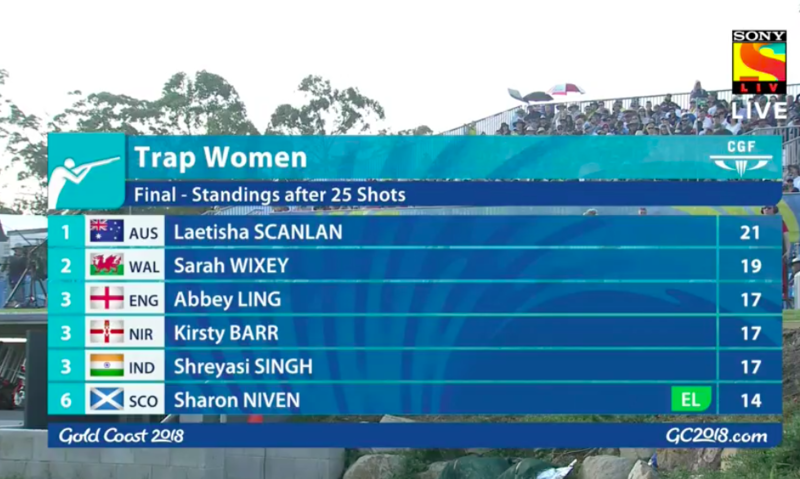 Scotland’s Sharon Niven becomes the first shooter to be eliminated. Shreyasi Singh has a good round in which she missed only one target. She’s still hanging by a thread though. Shreyasi Singh misses two more targets to take her total to 13/20. She’s placed fifth out of six with only five more shots to go before the eliminations begin! She needs to pick up! Shreyasi Singh misses three out of five targets between shots 11 and 15, taking her score to 10/15. There’s still 10 shots to go before eliminations begin but she needs to have two good rounds now to give herself a buffer. Shreyasi Singh misses two targets between shots 6 and 10 but she is still joint second in the table. Still some way to go before the eliminations begin, though. 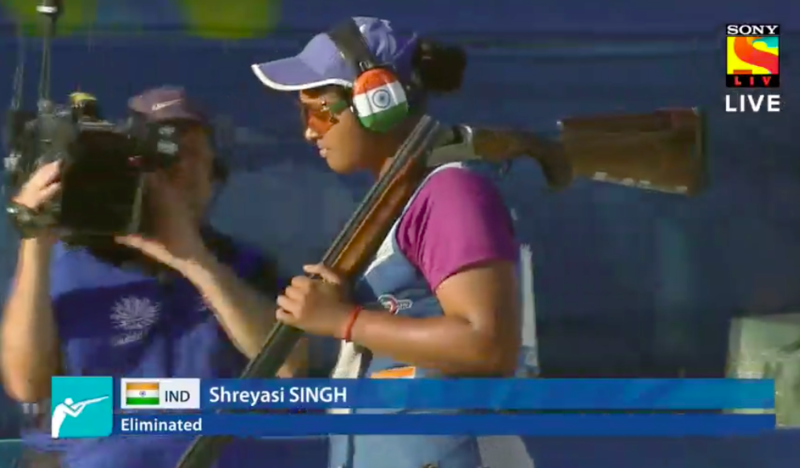 Shreyasi Singh is one of only two shooters who have a perfect score after the first five shots. Eliminations will begin after 25 shots. 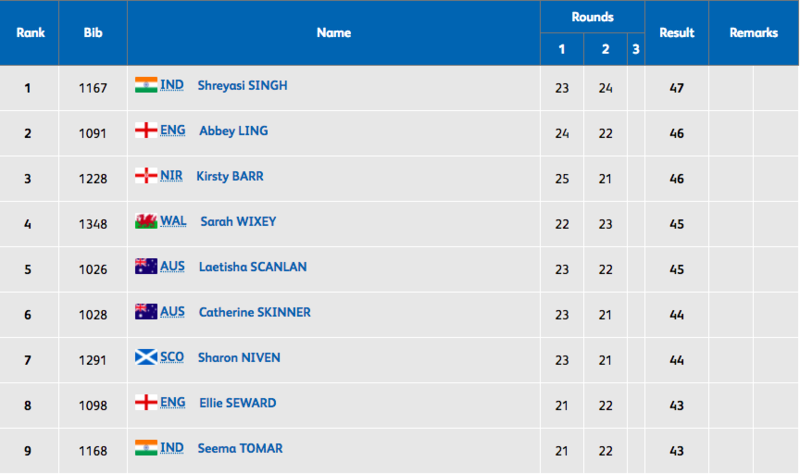 11.25 am: It’s time for the women’s Trap final, where Shreyasi Singh will go for her second medal at Gold Coast! 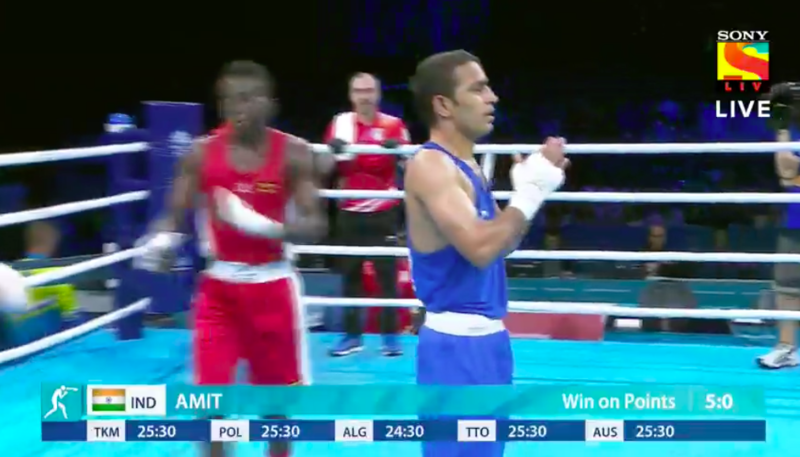 Big upset in the men’s 91 kg boxing as India’s Naman Tanwar is beaten in the semi-finals by Australia’s Jason Whateley! Tanwar was handed a penalty for hitting the back of Whateley’s head, meaning he would lose a point from each of the five judges’ scores. He needed a knockdown to win the bout but could not manage it. Tanwar will get the BRONZE, but he was one of the favourites for gold! Shreyasi Singh qualifies for the final of the Trap with a score of 67 over three rounds. Seema Tomar expectedly misses out, ending up 11th with a score of 61. 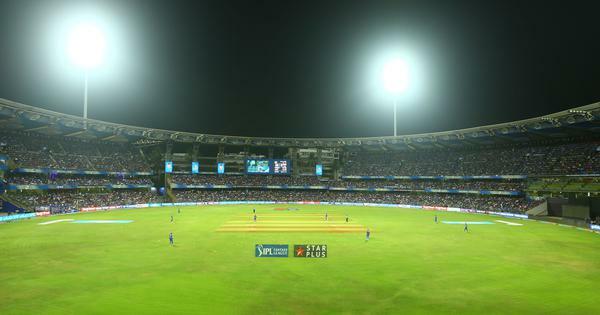 The final will begin at 11.25 am IST. Sharath Kamal plays a tough quarter-final match against England’s Liam Pitchford before prevailing in six games: 9-11, 13-11, 10-12, 11-9, 11-7, 11-9. 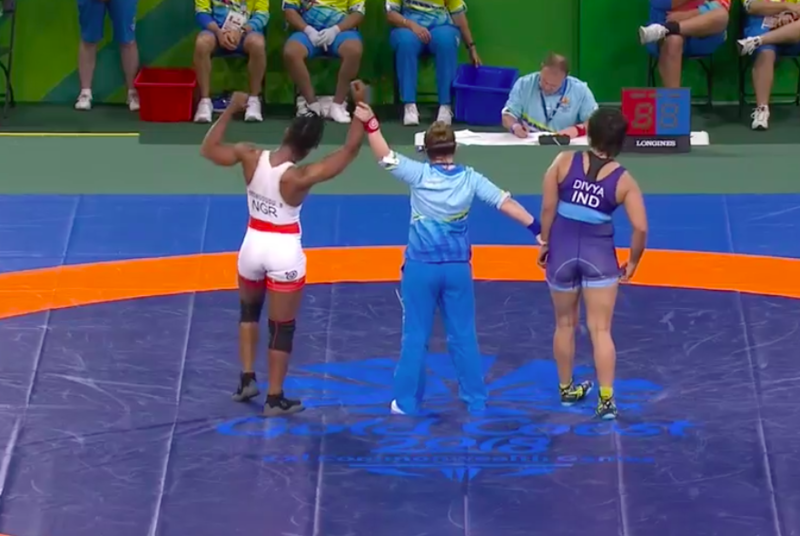 Sharath moves on to the semis, where he will take on Nigeria’s Quadri Aruna, who had earlier knocked out Harmeet Desai. K Srikanth and Saina Nehwal both reach the semi-finals quite comfortably, winning their quarter-final matches in straight games. 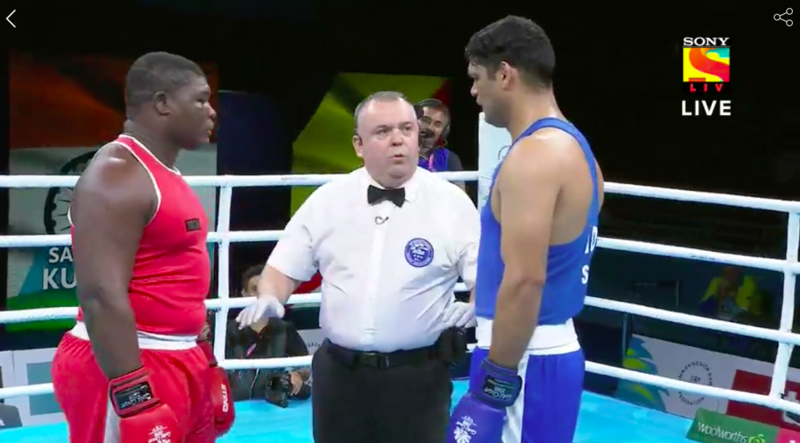 India’s Manish Kaushik is also through to the gold-medal round after winning his semi-final bout against Northern Ireland’s James McGivern via a 4:1 split decision! He joins compatriots MC Mary Kom, Amit Panghal and Gaurav Solanki in the boxing finals. 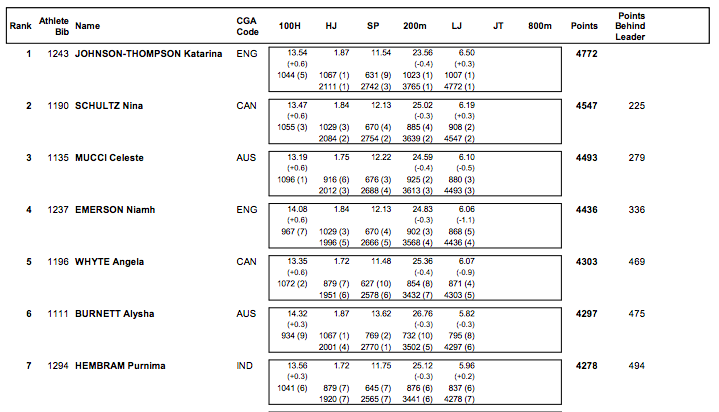 10.10 am: Here is the medals table as it stands. India, with 16 golds have overtaken their tally from Glasgow 2014 (15 golds). The Gold Coast Games are now India’s fourth most successful CWG after New Delhi 2010 (38), Manchester 2002 (30) and Melbourne 2006 (22). While Manchester may be a bit far out (but who knows? ), India can definitely expect to overtake their Melbourne tally. 10.05 am: The Field’s Zenia D’Cunha had spoken to Anish Bhanwala last year. Here is the story of India’s youngest Commonwealth Games gold medallist! 9.57 am: In 1998, at the age 15, Abhinav Bindra had then become India’s youngest participant in the Commonwealth Games. In 2018, at the age of 15, Anish Bhanwala has won gold at CWG – the youngest Indian to ever do so! Amaze! It’s a second GOLD in shooting for India on Day 9 as Anish Bhanwala wins the 25m Rapid Fire Pistol final after setting a new Games record! He beat Australian David Chapman’s Glasgow 2014 mark of 23 by seven points, finishing with 30! Neeraj Kumar could not get on to the podium, finishing fifth. 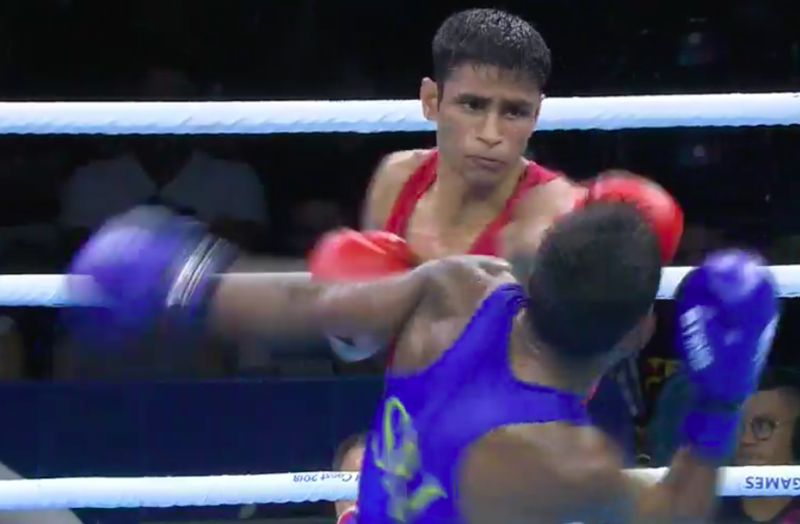 Gaurav Solanki and M Bandara engage in a gripping bout, one that saw the Indian being knocked down twice in three rounds but still won by a 4-0 split decision. Bandara was on top in the first round, before Solanki came back in the second. Bandara again looked the better of the two boxers at the beginning of the third round but Solanki ended it on top of the Sri Lankan. 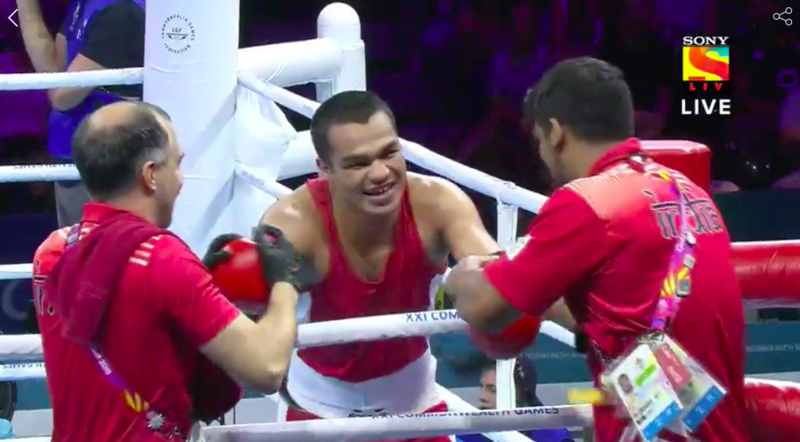 Bandara will feel very unlucky after missing out considering how well he fought, but surprisingly none of the five judges gave him a higher score than Solanki in either of the rounds. 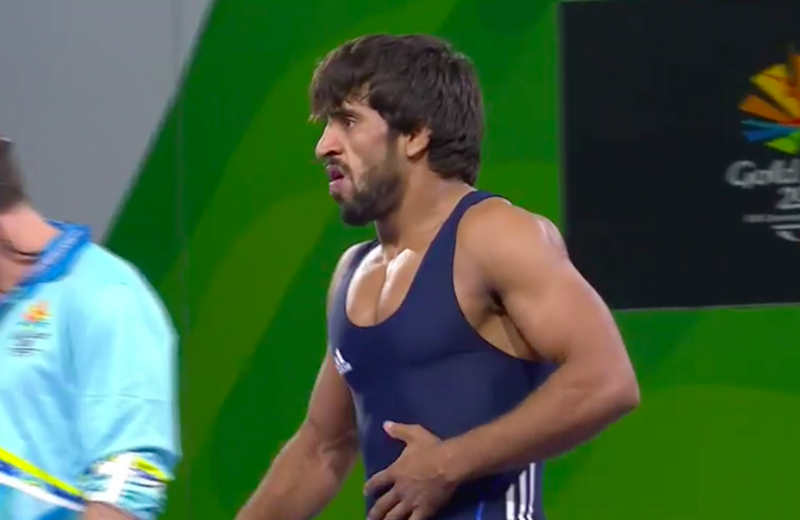 Solanki moves on to the final where he will fight for gold! After Day 1 of the qualifying round, India’s Kynan Chenai is in the sixth and final cut-off position for the final with 46 points across two rounds. Malta’s Brian Galea leads with 48 and it’s very tight at the top! India’s Manavjit Sandhu could only manage 43 and he sits in 23rd place after Day 1, making his qualification for the final rather difficult. The second and final day of qualification is Saturday. India’s Amit Panghal is through to the gold-medal round after beating Uganda’s Juma Miiro 5-0 on points. Through most of the bout, the Indian southpaw barely used his right hand and was always on top of his opponent. Amit will take on England’s Galal Yafai in the final on Saturday. It's a big day for Indian boxers, folks. All the men are in action today in their semi-finals. Medals assured, they will attempt to make it to the the finals of their respective categories. Harmeet Desai has been knocked out by Nigeria’s Quadri Aruna in the quarter-finals. Desai did not win a single game in the match. Purnima Hembram records a best throw of 41.57 m but that’s only good enough to fetch her seventh position. 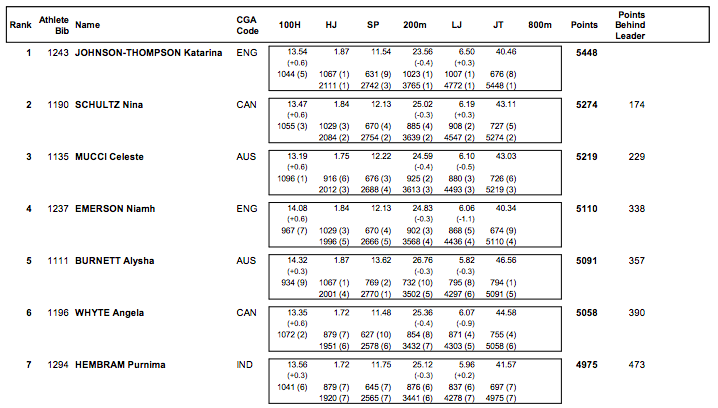 In the overall heptathlon standings after six of the seven events, Purnima maintains her seventh rank with 4,975 points. She is 473 points behind the leader, England’s Katarina Johnson-Thompson, and 244 points behind Australia’s Celeste Mucci who is in the bronze position. Shreyasi Singh is on top of the qualification table after two of the three rounds and should easily make the cut for the final. Seema Tomar, however, is in 10th position and is danger of missing out. She needs a great third round as only the top six qualify for the final. India’s Anish Bhanwala and Neeraj Kumar both reach the final after finishing on top of the qualification table. The final will begin at 9 am IST. Anish missed the qualification Games record by three points. Ashwini Ponnappa and Sikki Reddy are through to the semi-finals of the women’s doubles after beating a Sri Lankan pair in straight games. Satwiksairaj Rankireddy and Chirag Shetty are stretched to three games by Malaysia’s Peng Soon Chan and Soon Huat Goh but eventually win to also book a last-four spot. There was bad news for Ruthvika Shivan G, however, who retired midway through the first game of her quarter-final against Kirsty Gilmour. The Indian team, featuring Jeevan Suresh, Jacob Amoj, Muhammed Anas and Arokia Rajiv, has reached the final by finishing second in their heat. They clocked a timing of 3:04.05 to be second behind Jamaica. The final will take place on Saturday. Mouma Das and Manika Batra have reached the final of the women’s doubles event after beating Malaysia’s Ying Ho and Karen Lyne 3-0. However, Pooja Sahasrabudhe and Sutirtha Mukherjee lose in the other semi-final, which unfortunately means there won’t be an all-Indian final. Sahasrabudhe and Mukherjee will clash with Malaysia’s Ying Ho and Karen Lyne for the bronze, while Das and Batra will fight for gold against Singapore’s Tianwei Feng and Mengyu Yu. Both matches will take place on Saturday. Joshna Chinnappa and Dipika Pallikal reach the semi-finals after beating Canada’s Nikki Todd and Samantha Cornett 7-11, 11-5, 11-9. They are the defending champions in this event. Vipin Kashana joins Neeraj Chopra in the final after a throw of 78.88 m in his very first attempt. The qualifying mark is 78 m.
India’s Pooja Dhanda will take on Cameroon’s Joseph Essombe Tiako in the semi-finals of the women’s Freestyle 57 kg category at 12.35 pm IST. Divya Kakran will also contest the semi-finals of the Women’s Freestyle 68 kg Nordic category despite losing one of her two group matches. Kakran will take on Nigeria’s Blessing Oborududu in the semi-final at 12.40 pm IST. It’s GOLD for Tejaswini Sawant, who wins the Women’s 50m Rifle 3 Positions Final after setting a new Games record! If that weren’t enough, Anjum Moudgil wins the SILVER, completing a superb 1-2 finish for India! Awesomesauce!! 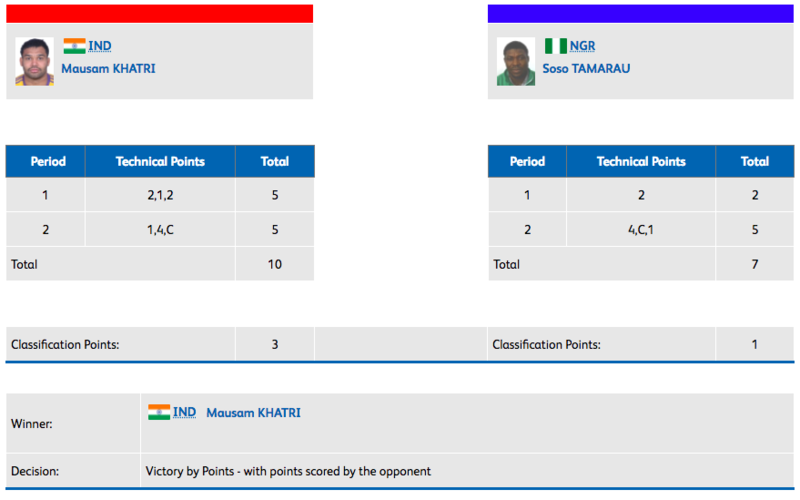 A second Indian wrestler is through to the final of their category – this time it’s Mausam Khatri, who defeats Nigeria’s Soso Tamarau 10-7 in what must have been a gripping semi-final match! Unfortunately, the match was not shown live. 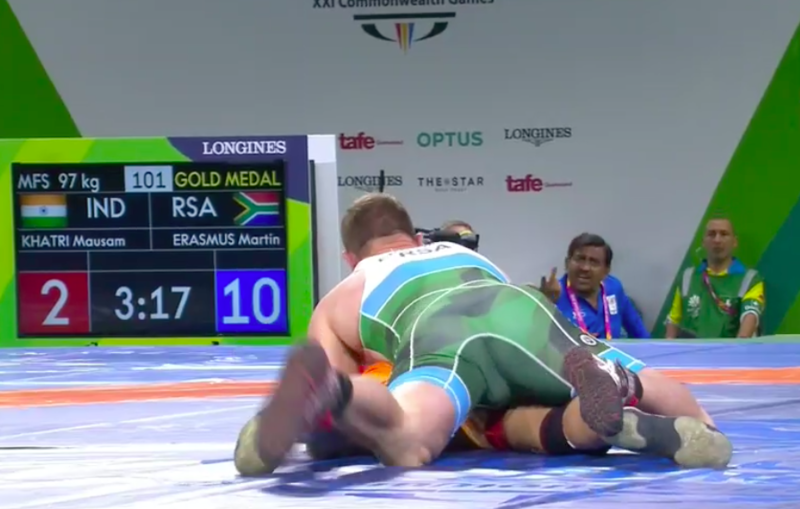 Khatri will grapple for gold with South Africa’s Martin Erasmus at around 1.45 pm IST. Two Indian athletes have been asked to leave the Games Village after they breached the no-needle policy, according to a Commonwealth Games Federation release. Race walker KT Irfan and triple jumper Rakesh Babu will be sent home on next available flight. What is it with Indian athletes and needles?! Bajrang Punia is through to the final of the category after winning his third straight match by technical superiority! There seems to be no stopping this guy as he races to a 10-0 lead against Canada’s Vincent de Marinis in the semi-final before being awarded the match. Super stuff! Bajrang will grapple for gold with Wales’s Kane Charig at around 1 pm IST. 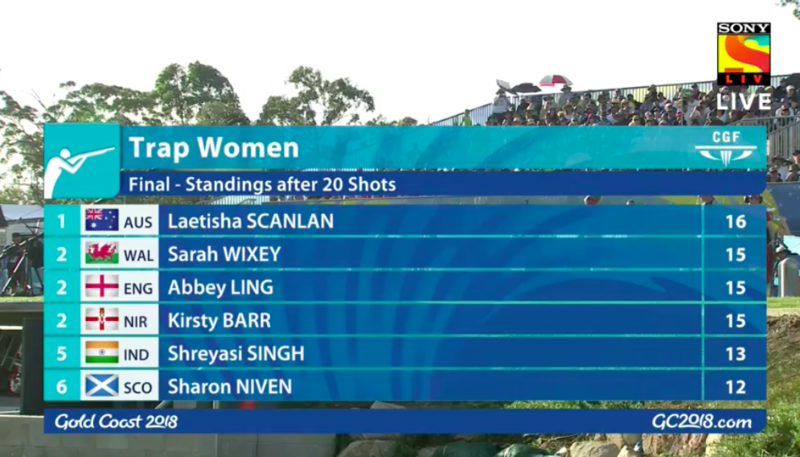 Tejaswini Sawant has taken the lead in the final after ending the Prone position with 310.1 points. Singapore’s Xiang Wei Jasmine Ser is second with 309.1, while Anjum Moudgil is third with 308.0. We now move into the standing stage, where shooters will begin to get eliminated. Pooja Dhanda wins her second match of the group as well, this time by pinning New Zealand’s Ana Moceyawa down in the first period itself. Pooja tops her group with eight classification points! India’s Jinson Johnson qualifies for the 1,500m final after finishing second in Heat 2. 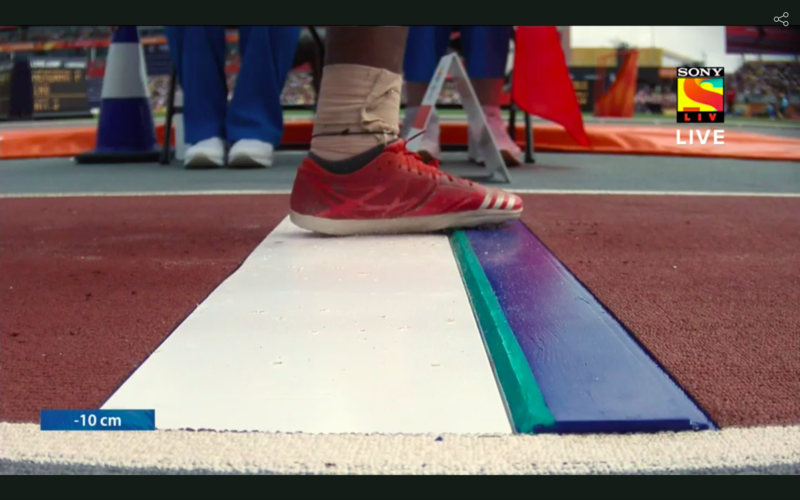 He clocked a timing of 3:47.04. The top four from each of the two heats make the final. 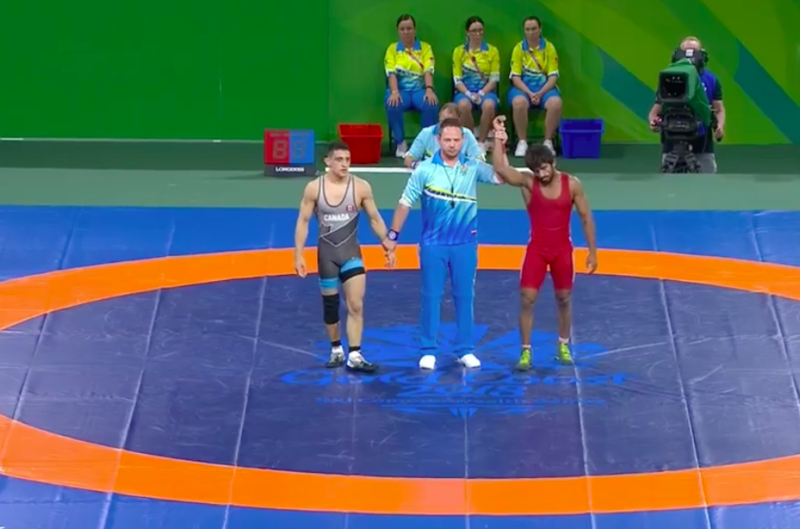 Bajrang is coasting through his draw, winning his second match of the day by technical superiority via five two-point take-downs across both periods against Nigeria’s Amas Daniel. Bajrang is through to the semi-finals of this category! Tejaswini Sawant is currently in second place after scoring 152.4 in kneeling position. Anjum Moudgil has also scored a total of 151.9 to take the third spot. Singapore’s Xiang Wei Jasmine leads the pack with a score of 153. The shooters will now move to Prone and then to standing position when the elimination will start. With the mixed doubles combinations of A Sharath Kamal/Mouma Das and Manika Batra/Sathiyan G booking their spots in semi-finals, India are assured at least one medal in the event. However, there was heartbreak for Madhurika Patkar and Sanil Shetty as they go down 2-3 against Tin Tin Ho/Liam Pitchford in their quarter-final. Sharath/Mouma and Manika/Sathiyan will not be facing each other in the semi-finals, which means there is a chance for an all-Indian mixed doubles final! India’s Mausam Khatri wastes no time in his quarter-final match against Alexios Kaouslidis from Cyprus, notching up three four-point take-downs in the first period to win the match by technical superiority. Khatri is through to the semi-finals! India’s Pooja Dhanda wins her Nordic group match rather comfortably, by a 12-5 point margin against Canada’s Emily Schaefer. The Canadian injured her arm midway through the match and looked in a lot of discomfort. She tried to shield it through the rest of the match but Pooja was able to exploit her opponent’s weakness well. 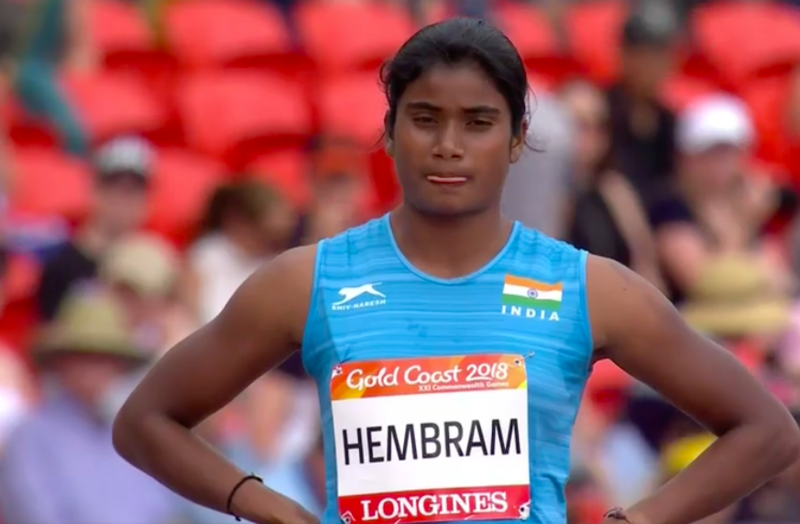 Purnima Hembram finishes sixth in the long jump event of the heptathlon. Her overall position in the competition is still seventh. She’s almost 500 points off the leader, England’s Katarina Johnson-Thompson, and more than 200 points behind the athlete in the bronze medal position right now, Australia’s Celeste Mucci. The wrestling action has begun at Gold Coast and India’s Bajrang has no trouble getting past New Zealand’s Brahm Richards in the Round of 16. Bajrang was awarded the match by technical superiority after racing to a 10-0 lead in the first period. Oh no! Purnima Hembram’s third attempt is red-flagged after she oversteps the line. She knew it as soon as she jumped and did not even land properly. Purnima Hembram does slightly better in her second attempt, jumping 5.96 m. She’s slowly approaching her personal best of 6.01. Neeraj Chopra reached the qualifying mark in his very first throw (80.42 m)! 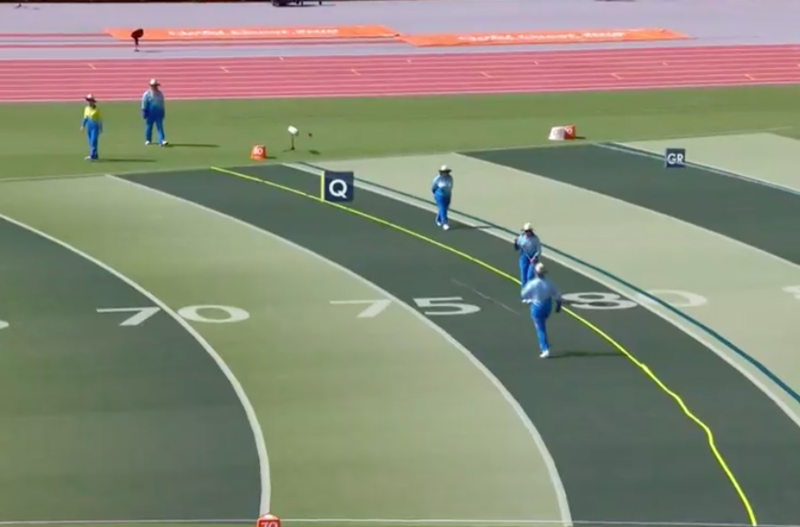 Only Anderson Peters of Granada managed a longer throw than Chopra with 80.44 on his third attempt. Neeraj Chopra is one of only three athletes so far who has cleared the automatic qualification mark for the Javelin Throw final. 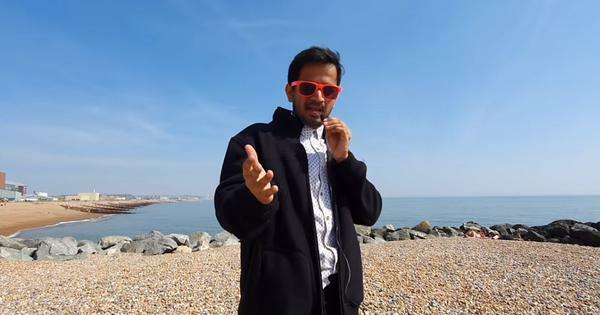 India’s Vipin Kashana, who is in a different group, can be expected to make the cut as well. 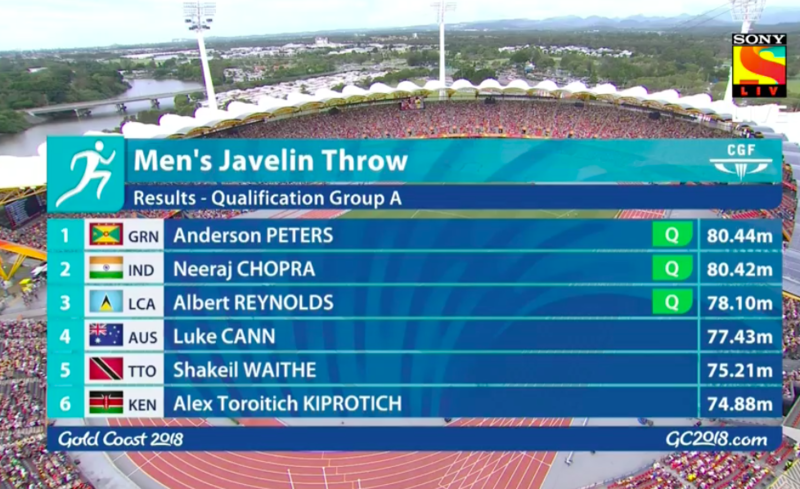 Neeraj is through to the Javelin Throw final! 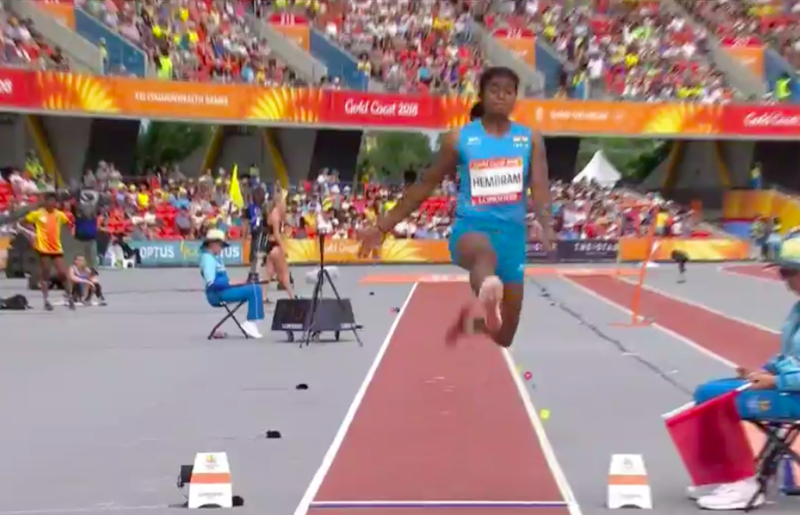 Purnima Hembram records a 5.79 m jump in her first attempt of the long jump event. Her personal best is 6.01 so she will hope to better her first attempt. Both Indian pairs are through to the semi-finals of the table tennis men’s doubles. Sharath Kamal and Sathiyan G won their QF in straight games, while Harmeet Desai and Sani Shetty took four games. The two Indian pairs are in opposite halves of the bracket, so they won’t be facing each other in the semi-finals but have a chance of securing a memorable all-Indian final! The semi-finals will begin at 1 pm IST. 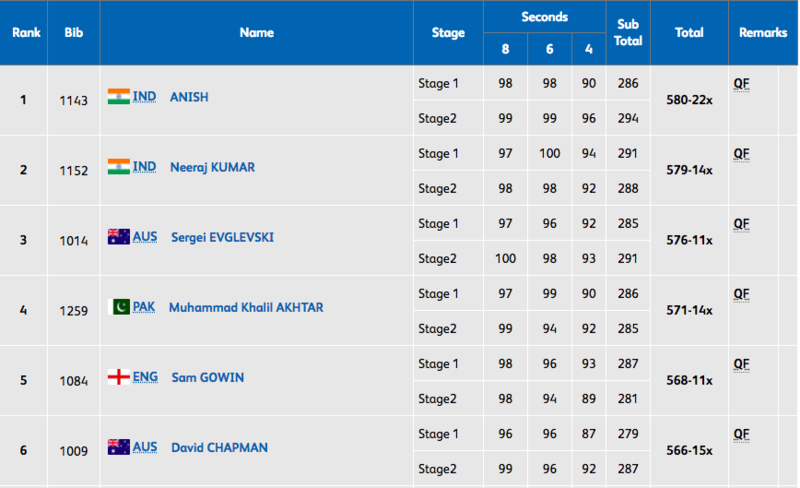 Anish Bhanwala and Neeraj Kumar ensure a 1-2 finish for India in the qualification round of the 25m Rapid Fire Pistol! Anish misses the qualification Games record by three points! The final will begin at 9 am IST. 5.40 am: The Men’s Javelin Throw qualifying round has begun and there are two Indians in the fray – Neeraj Chopra and Vipin Kashana. Anjum Moudgil sets a new qualification Games record in the category by finishing with a score of 589! The previous record was 581 set by Singapore’s Xiang Wei Jasmine SER at Glasgow 2014. 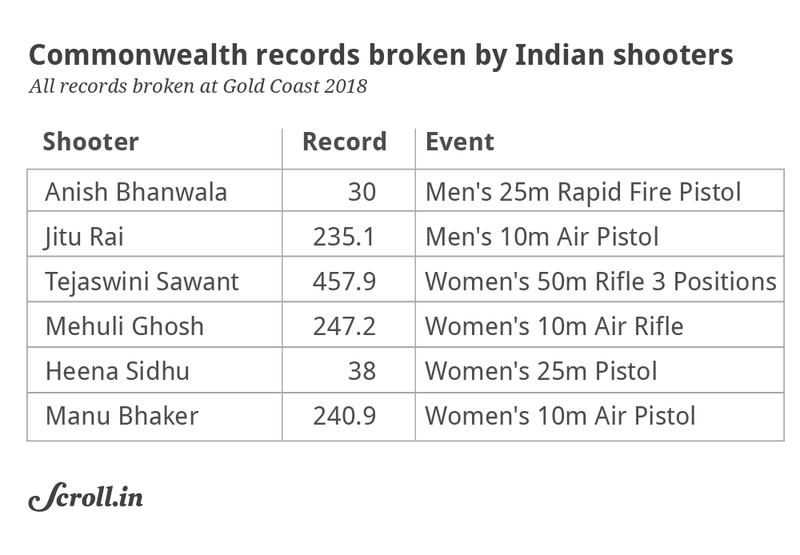 In fact, two other shooters also broke the record – Singapore’s Martina Lindsay Veloso (584) and India’s Tejaswini Sawant (582). The final will begin at 7 am IST. 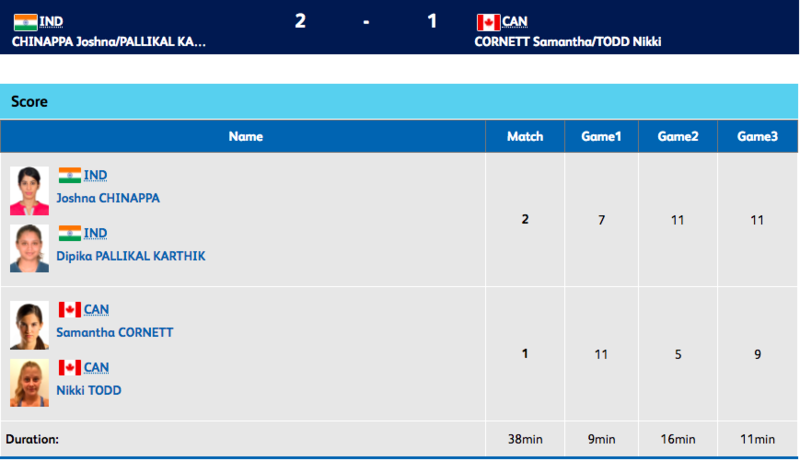 Harmeet Desai and Sanil Shankar Shetty take the first game against Australia’s Heming Hu and Xin Yan, but lose the next one that goes the distance. Sharath Kamal and Sathiyan G have a two-game lead over English pair David McBeath and Samual Walker. The table tennis action for the day begins with two Indian men’s doubles pairs – Harmeet Desai/Sanil Shetty and Sharath Kamal/Sathiyan Gnanasekaran – playing in the quarter-finals. Shreyasi Singh is doing well so far and is among the top six who will qualify for the finals. However, Seema Tomar needs to shoot better. 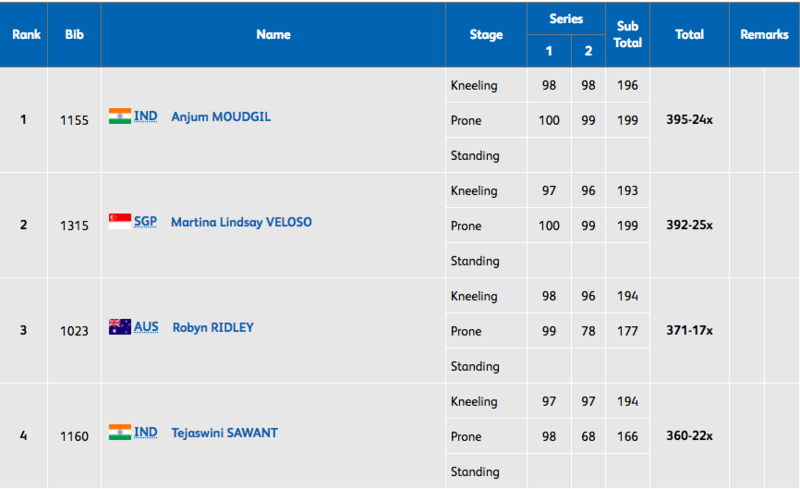 Indian shooters are doing really well, with Anjum Moudgil at the top after two of the three positions. Tejaswini Sawant is in fourth place. 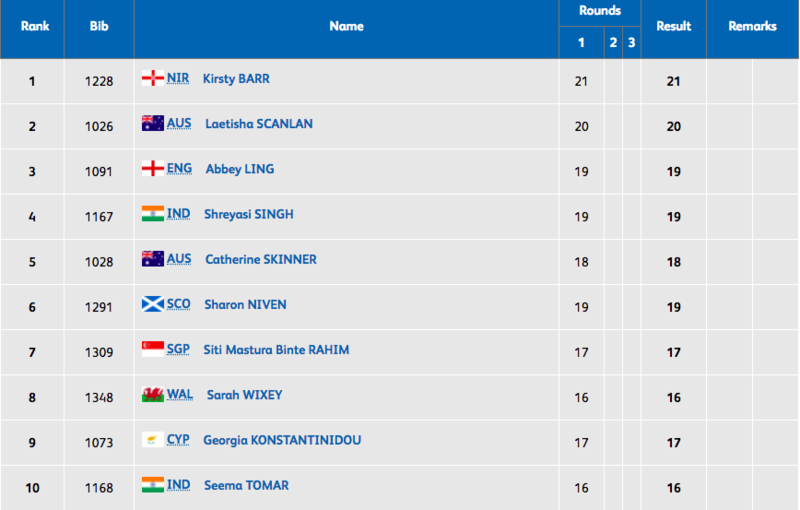 4 am: Good morning, everyone, and welcome to The Field’s live blog for what is a packed day nine of the Commonwealth Games for Indian athletes. The day begins for India with shooting, athletics and table tennis, before wrestling, boxing, badminton and other sports come in. Indians can win medals only in shooting and wrestling on Friday but they can go closer to the podium in sports such as badminton, squash and table tennis. Neeraj Chopra will be in focus as far as athletics is concerned, while Muhammed Anas will compete again in the men’s 4x400m relay. Here is the entire Day 9 schedule for India. If you missed the action on Day 8, where as many as four wrestlers added to India’s medal tally, including two gold, here is a recap.